You can add materials to objects in your drawings to provide a realistic look. The use of mapping adds complexity and texture realism to the material. For example, you can replicate grass or brick patters or tile on a floor. 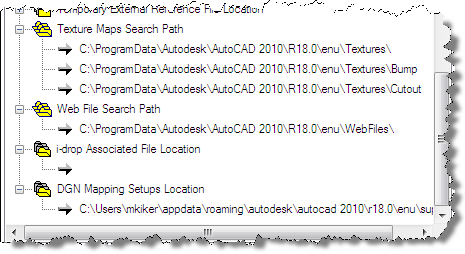 This setting specifies the folders to search for rendering texture maps. Specifies the folders to search for photometric web files. No need to edit this. Specifies the location of data files associated with i-drop content. When the location is not specified, the location of the current drawing file is used. You can manage translation mapping setups for DGN file import and export operations. This specifies the location of the dgnsetups.ini file where DGN mapping setups are stored. This location must exist and have read/write permissions for DGN commands to function normally. Just leave this as is but make a note of where this is so you can refer to it later if needed.